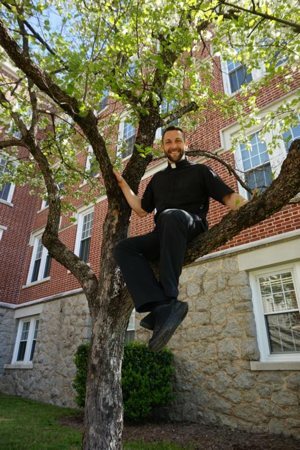 An Arkansas Catholic priest is taking his ninja name “Father Flex” national as a contestant on the new season of the NBC reality show “American Ninja Warrior,” debuting May 30. Father Stephen Gadberry, pastor of St. Mary Church in Batesville and St. Cecilia Church in Newport, applied last December to be on the show, which allows everyday “warriors” to show off their skills in a series of challenging obstacle courses. Competitors advance from city qualifying and finals to regional finals and finally national finals in Las Vegas. The grand prize winner receives $1 million. Father Gadberry, 32, received a call in mid-February to compete in Dallas for a spot as a contestant. Tryouts were held during Holy Week. On Palm Sunday, March 25, the priest was running, jumping and launching through the air on an obstacle course. Surrounded by friends, family and fellow religious, including sisters and brother priests, Father Gadberry and other ninja hopefuls competed from 10 p.m. until 7:45 a.m. the next morning. “Hold on tight, breathe, concentrate, focus. Really in the heat of the moment it’s just survive. Just keep moving forward one more step, one more step, that’s what was going through my mind, just one more step,” he told the Arkansas Catholic, newspaper of the Little Rock Diocese. “It was crazy, but it fed in perfectly into Holy Week,” he said. “On the obstacle course, you have to identify the obstacle, you’ve got to plan to attack it and to go on knowing that it’s going to be kind of hard, but knowing that there’s an end in sight. His passion for CrossFit, as both an exercise regimen and now as a certified trainer, prepared him well. The priest’s parishioners think it’s fun that he tried out for the show, but it’s more about “sharing the joy of being Catholic,” he said. “What they’re excited about is that the church that they’re a part of is doing things that people usually wouldn’t imagine. So their church is going to the peripheries is what Pope Francis says,” he said. “They’re telling all these other people of different faiths and denominations that ‘my church is not one that is stuck in a box. My church is one that can go and do crazy stuff. Come check it out,'” Father Gadberry added. He said the camaraderie with his fellow competitors was a highlight, along with meeting Sean Bryan, known as the “Papal Ninja” from season nine of “American Ninja Warrior.” The two first met on social media and met a few times in Dallas. Bryan offered the priest some tips and advice. “His greatest tip was just to have fun. And that helped me to stay calm through it,” Father Gadberry said. Confirmation students at St. Mary Church eagerly offered up various nicknames for his time on the show. Father Gadberry said his favorite was “Father Flex.” It fits nicely with his often-used hashtag “jesusismyhomie” on Instagram. “Father Flex is not just muscles. … With all this stuff I want to invite people to take it to the next level, go to the spiritual level,” he said. Part of spreading the Gospel is breaking the priest stereotype. “So many of my brother priests have amazing talents,” from music to athleticism, “so anyone reading this, their pastor has an amazing talent or two or three. Ask them about it, because it reveals the human side of us,” he said. For him, physical and spiritual well-being are parallel. Little Rock Bishop Anthony Taylor encourages all priests to “always be learning and he really supports all of us studying things that we’re passionate about,” Father Gadberry said. “The spiritual life is important, but the soul needs a body. And that body must be a stable place where the soul can reside. We have to take care of our body; it’s the temple of the Holy Spirit as Paul says. This is just a way of continuing my education/formation so then I can be better equipped to catechize people through that hobby of mine,” he said.